You can configure the AWS Storage Gateway service as a Volume Gateway to present iSCSI block storage volumes to your on-premises applications. The Volume Gateway provides either a local cache or full volumes on-premises while also storing full copies of your volumes in the AWS cloud. Volume Gateway also provides Amazon EBS Snapshots of your data for backup, disaster recovery, and migration. It's easy to get started with the Volume Gateway: Deploy it as a virtual machine or hardware appliance, give it local disk resources, connect it to your applications, and start using your hybrid block storage. Volume Gateway works with your existing applications through the industry-standard iSCSI protocol. You can deploy it as a virtual machine or on hardware appliance for the Storage Gateway. Additionally, the volume gateway makes your application data available for use in Amazon EC2 through EBS Snapshots, which can be mounted as EBS volumes. The Volume Gateway maintains on-premises either a cache of recently accessed data, or a full volume copy, so your applications get the benefit of fast access to data. At the same time, all of your volume data is stored durably and cost-effectively in AWS, with petabyte scalability. With Amazon EBS Snapshots, Storage Gateway volume clones, and AWS Backup, you have numerous options to restore the application data stored in your volumes, back to the existing volume gateway on-site, to EBS for recovery of your application into EC2, or even to a new Volume gateway running at another on-premises location. You can run Volume Gateway in two modes: Cached and stored. With cached volumes, the Storage Gateway service stores the full volume in its Amazon S3 service bucket, and a portion of the volume—your recently accessed data—is retained in the gateway’s local cache for low-latency access. With stored volumes, your entire data volume is available locally in the gateway, for fast read access. At the same time, Volume Gateway maintains an asynchronous copy of your stored volume in the service’s Amazon S3 bucket. Data written to gateway cached volumes can be asynchronously backed up as point-in-time snapshots of your volumes, and stored in the cloud as Amazon EBS snapshots. With stored volumes, such snapshots are required. You can schedule and manage snapshots with the service’s native snapshot scheduler or the AWS Backup service. These snapshots are incremental backups that capture only changed blocks. All snapshot storage is also compressed to minimize your storage charges. AWS Backup supports backup and restore of both cached and stored volumes. Many customers use Volume Gateway in conjunction with Windows and Linux file servers on premises to provide scalable storage for on-premises file applications with cloud recovery options. With a cached volume architecture, they get the benefit of scalable cloud storage and data protection for growing file stores that demand low-latency local access for frequently used data. Customers often choose the Volume Gateway for backup of local applications, and for disaster recovery based on EBS Snapshots, or Cached Volume Clones. The Volume Gateway integration with AWS Backup enables customers to use the AWS Backup service to protect on-premises applications. Using AWS Backup with Volume Gateway helps you centralize backup management, and meet compliance requirements with customizable scheduled backup policies including retention and expiration rules. With EBS Snapshots of Storage Gateway volumes, you can easily migrate on-premises data to EBS, to use with Amazon EC2 based applications. An initial snapshot captures the full volume, which can be used for migration testing. Then incremental snaps can be used to migrate changed blocks, and do the final copy when you are ready to pause the application on-premises and cut over. Have questions? Check out the Volume Gateway FAQs. 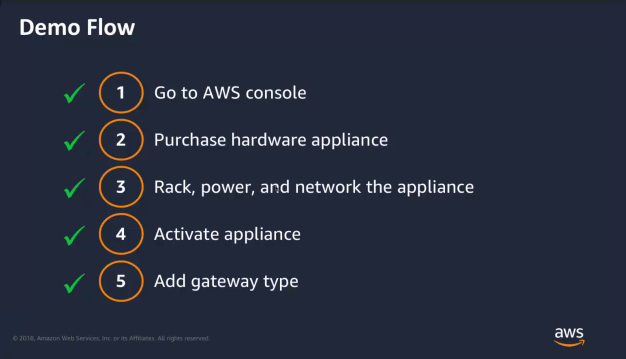 Get started building with Storage Gateway in the AWS Console.